Hey everyone! 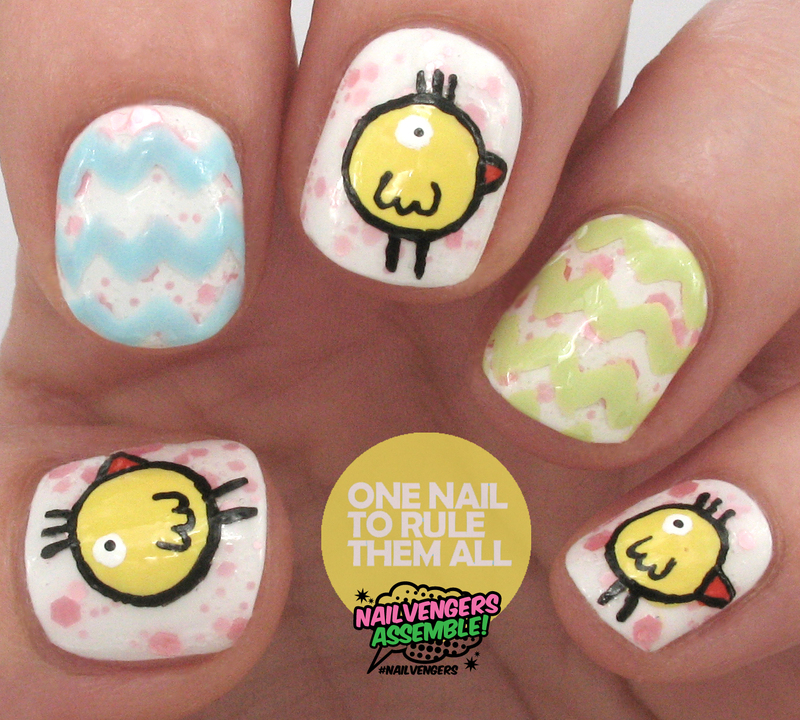 Today is the last day of the month, and that of course means a new Nailvengers Assemble post. If you're not sure what I'm talking about, you can see my original post here. Don't forget to keep up to date with what we're doing on our Facebook page. This month's theme is Easter, and whilst it's quite early, by the last day of April it will be too late so we decided it was better to do it now instead. 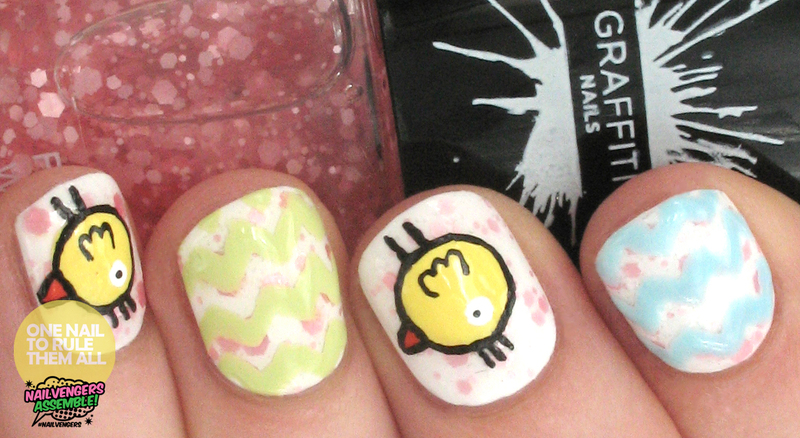 Easter for me is all about cute little chicks and decorated easter eggs, so I decided to combine the two! I used a base of Graffiti Nails - Ice White, with a coat of Graffiti Nails - Fairy Wing. Once that was dry I used a striping brush with W7 - Sheer Blue and Deborah Lippmann - Spring Buds on my ring and index finger. Then I used a nail art brush to draw a yellow circle using Graffiti Nails - Mellow, and to draw on the beak using Rimmel London - Oragasm, from the Rita Ora collection. Then I used a thinner brush to outline the bird using black acrylic paint, and to do the eye with white and black acrylic paint. Then I topped it off with a coat of Seche Vite to seal everything in. Ahh your little chicks are super cute!! Adorable! I love the Ice White/Fairy Wing base! The chicks are just too cute. Precious little chicks! I love how the Graffiti Nails worked so perfectly with this. 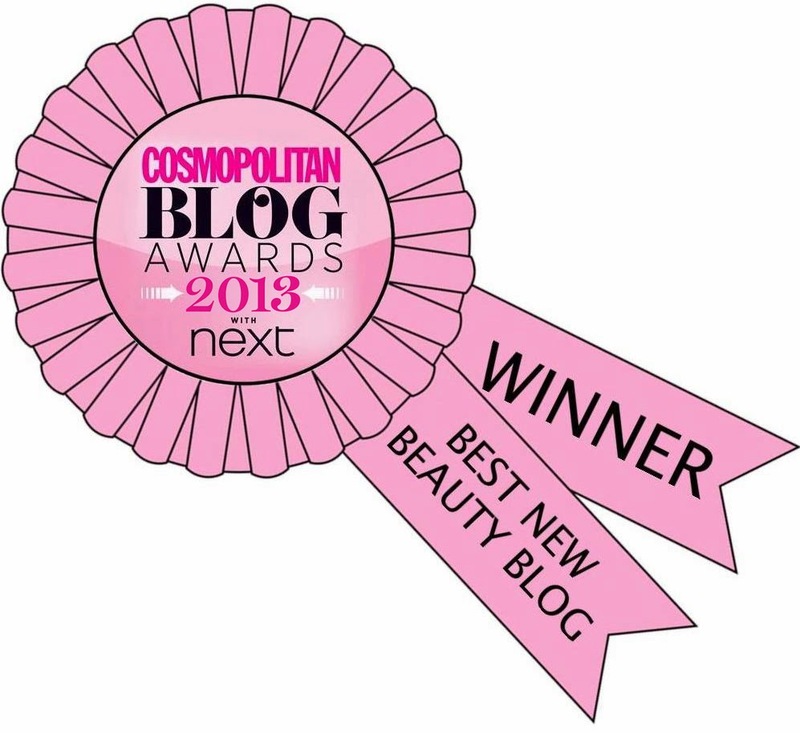 I love every little thing about these, aww!